BTS release their first album of 2019. Shared through social media, BTS’ company Big Hit Entertainment revealed the album will be a seven-track EP. It will be fronted by the single “Boy With Luv” (also known as “A Poem for the Small Things”) that features Halsey, and will also include the already-released RM solo “Intro: Persona,” along with the songs "Mikrokosmos," "Make It Right," "HOME," "Jamais Vu," and "Dionysus." 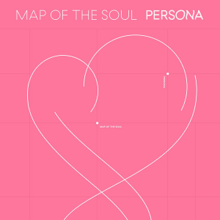 The album title is inspired by Jungian philosophy, as related through Murray Stein’s Jung's Map of the Soul, the Korean version of which is currently being sold by Big Hit Entertainment, and "Boy With Luv" appears to be a callback to BTS' 2014 single "Boy In Luv." The track list reveals that several song titles are similarly inspired by classical and philosophical influences: "Mikrokosmos" translates into "microcosm" from Greek; the Korean title “소우주" has a similar meaning. It appears to be a reference to Béla Bartók's early 20th century piano composition.